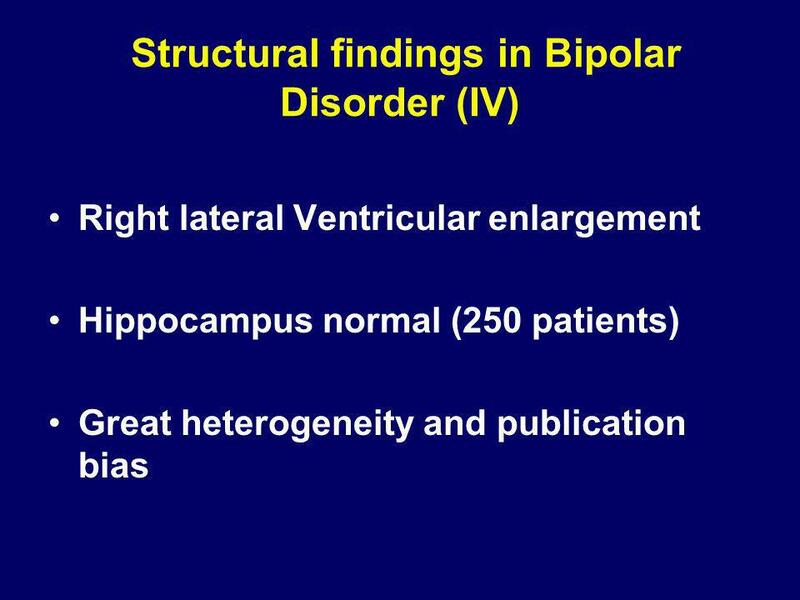 Right lateral Ventricular enlargement Hippocampus normal (250 patients) Great heterogeneity and publication bias Only the right later ventricular enlargement distinguished controls from bipolar patients The hippocampus was normal and this analysis included 250 patients The authors emphasized the great…. 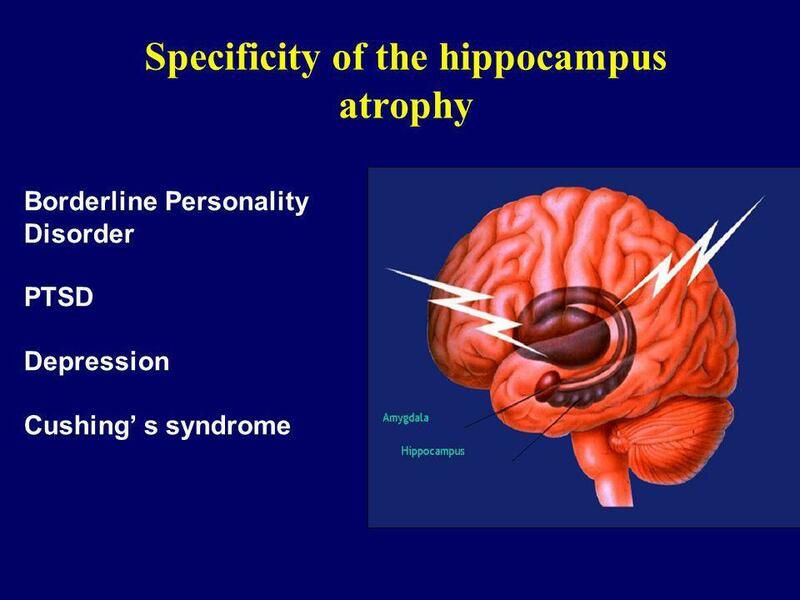 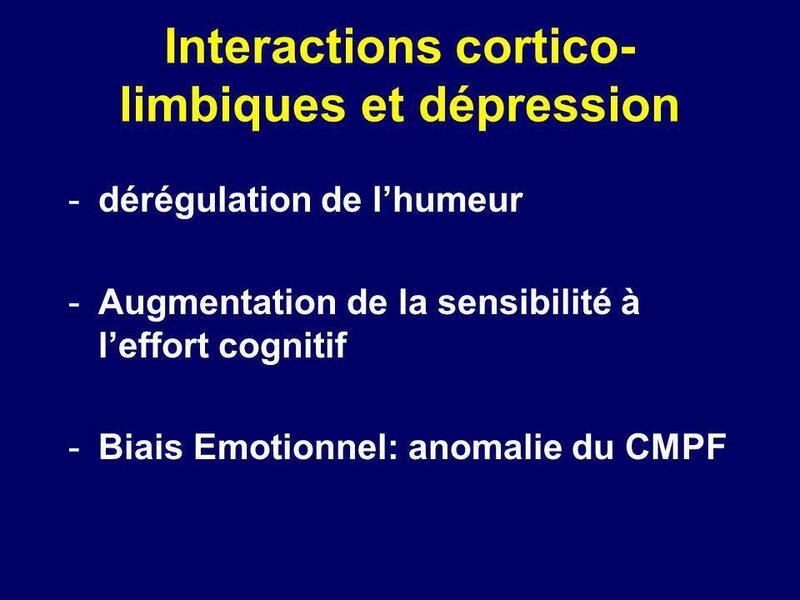 Borderline Personality Disorder PTSD Depression Cushing’ s syndrome The hippocampus is involved in …..
Hippocampus function Learning and Memory Regulation of stress response - Emotion regulation The hippocampus is involved in …..
Tristesse intense et durable Labilité de l’humeur Dysphorie Mood dysregulation in depression is characterized by an intense and persistent sadness not adapted to the context We can also observe mood lability, frequent mood swings especially in bipolar patients finally many depressed patients complain about loss of pleasure and interest during activity This anhedonia is more pronounced for sensorial pleasure rather than social pleasure What are the neural structures that regulate normal mood changes in normal subjects? 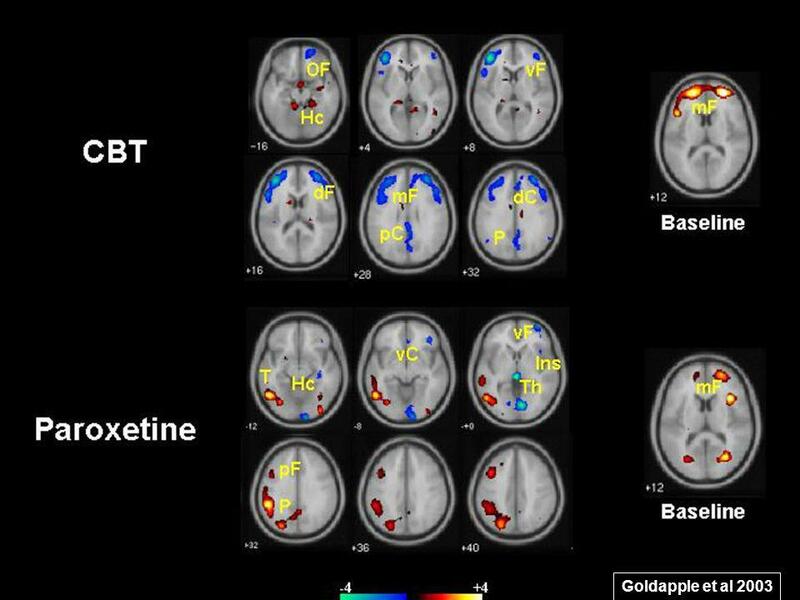 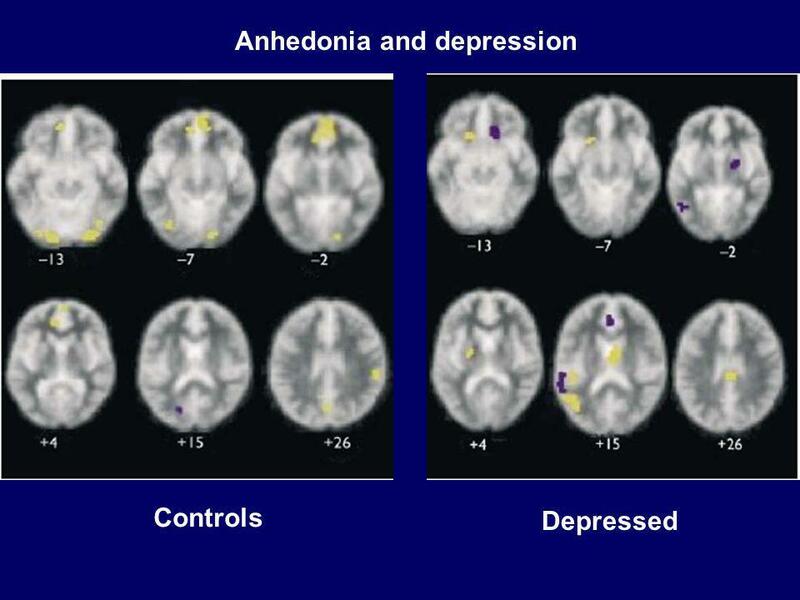 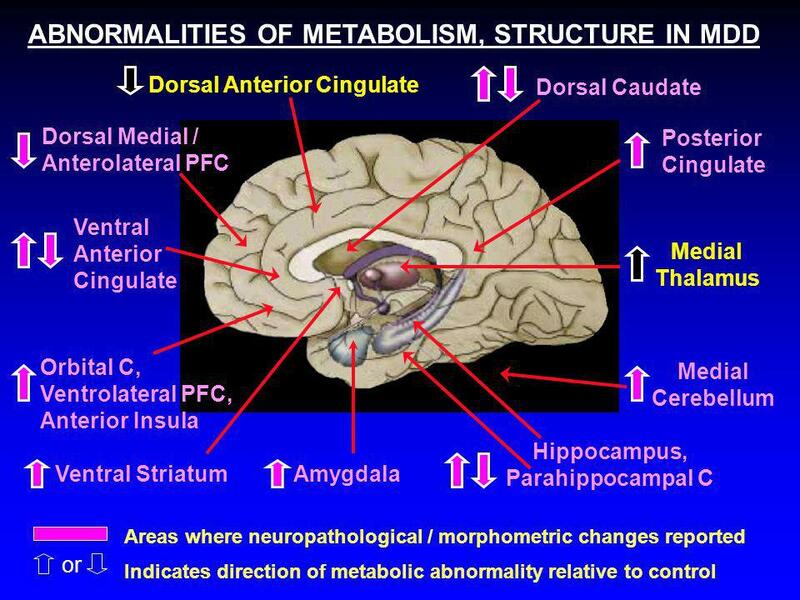 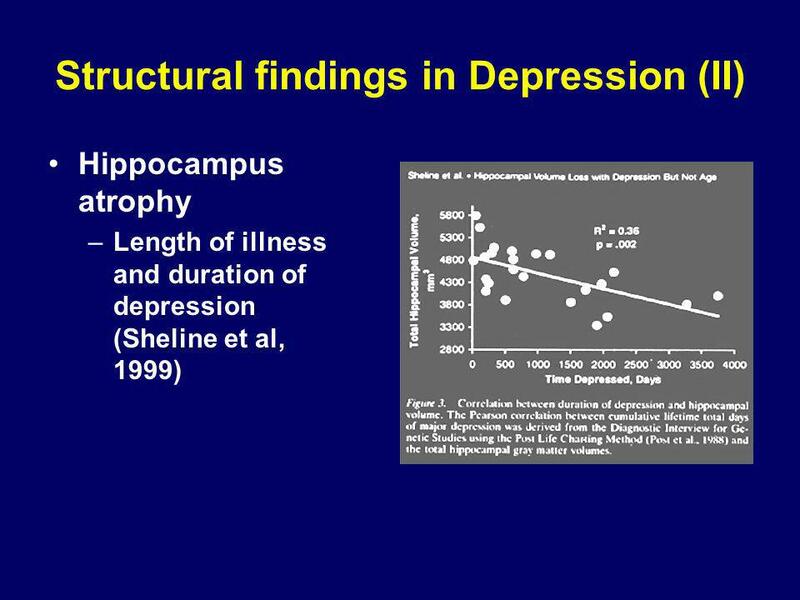 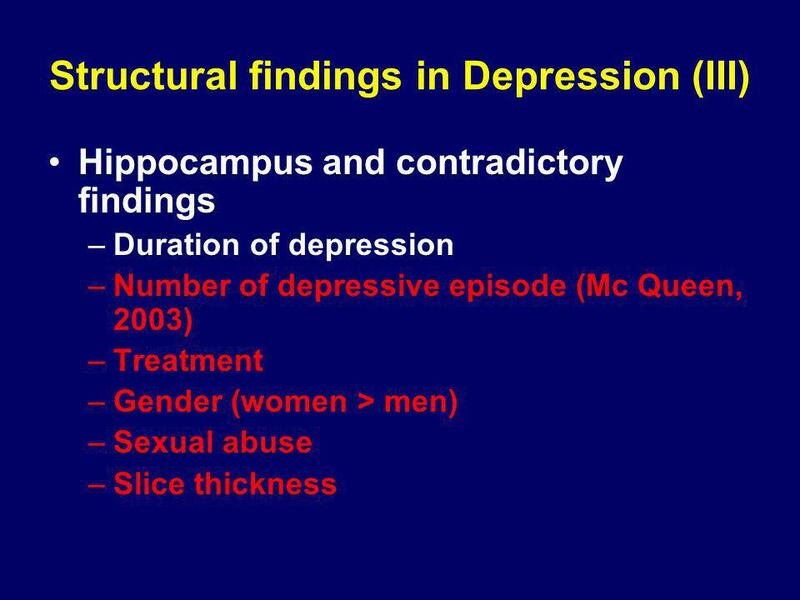 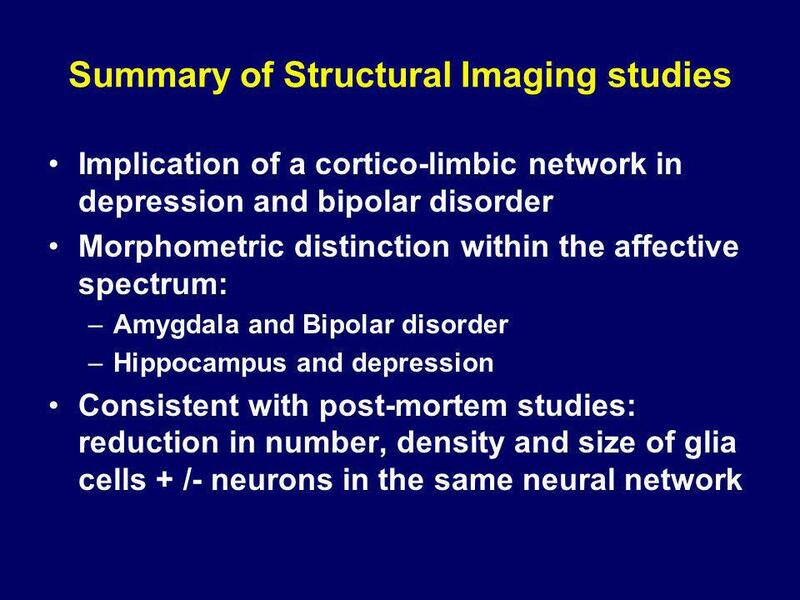 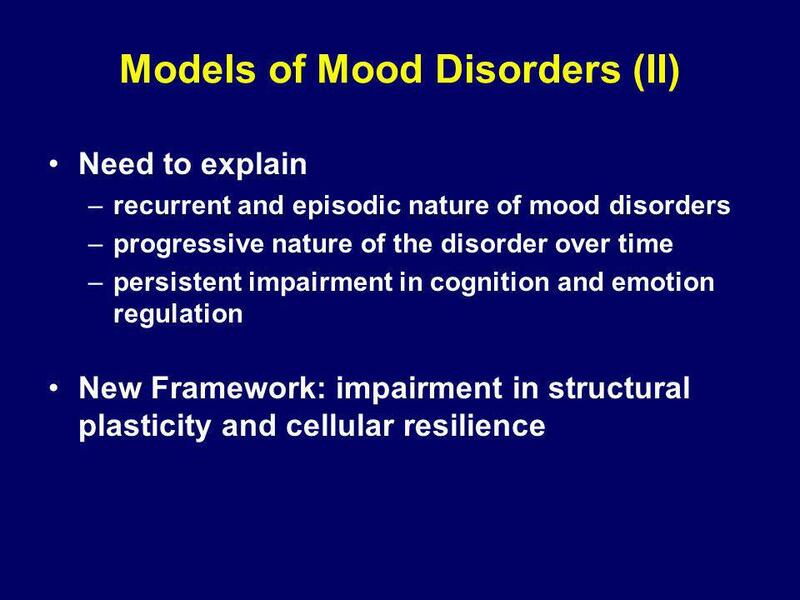 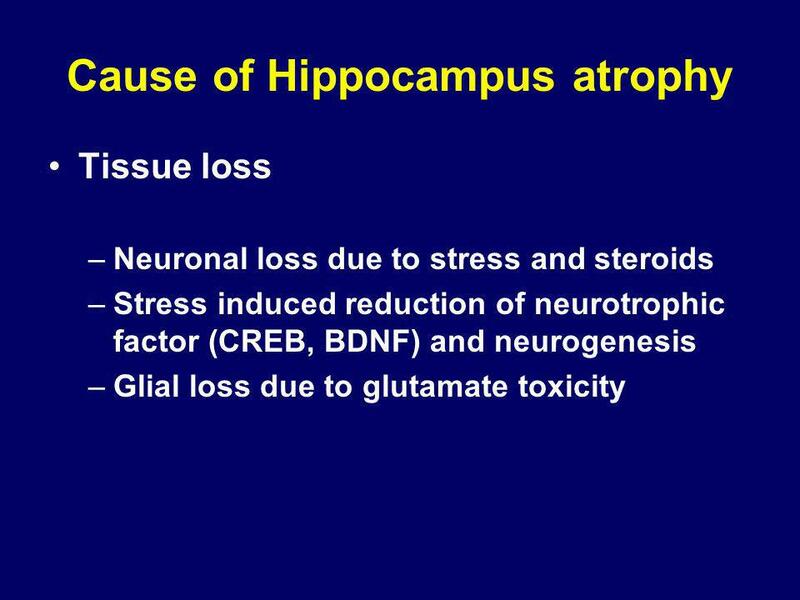 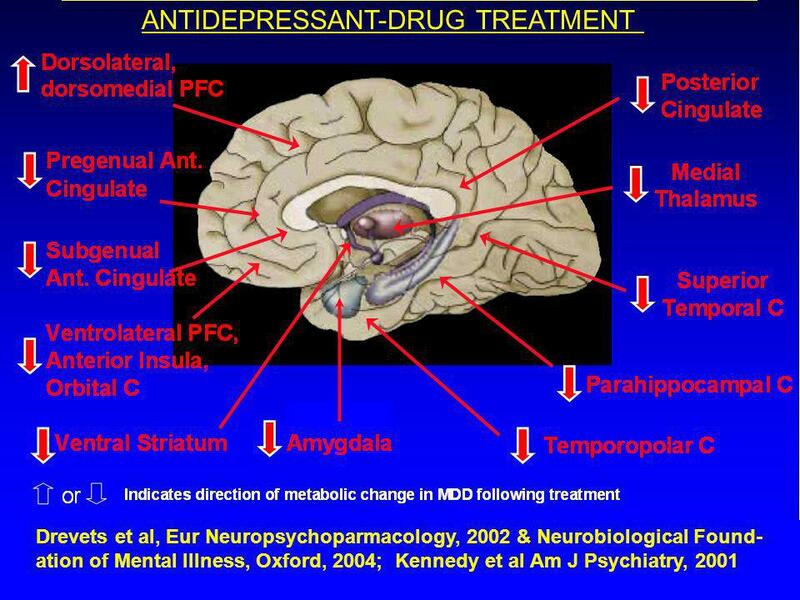 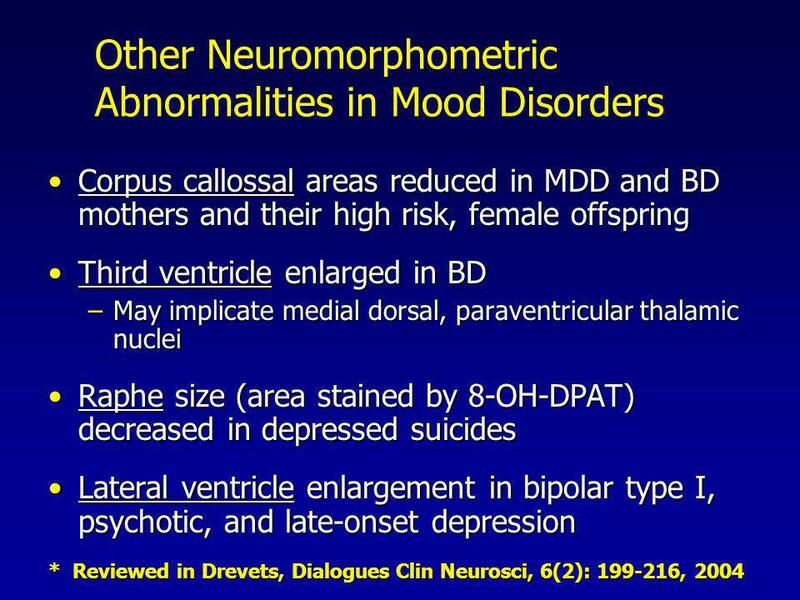 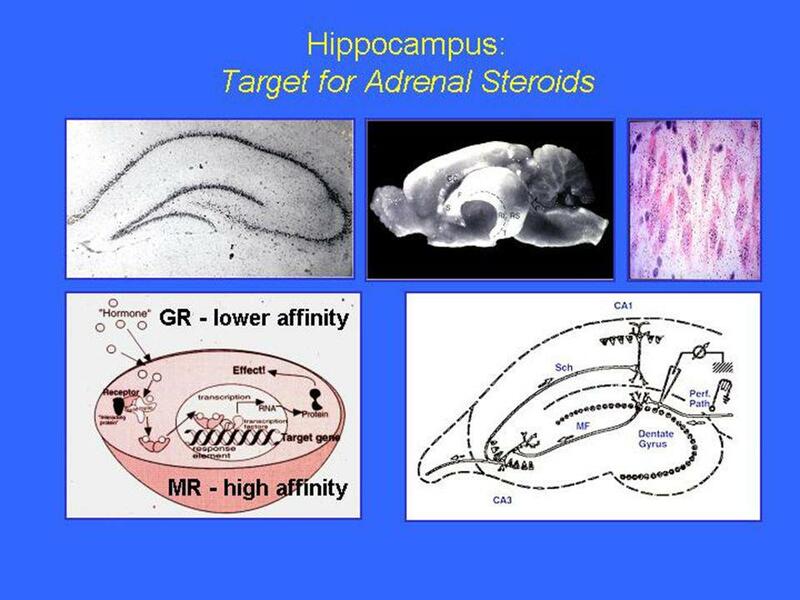 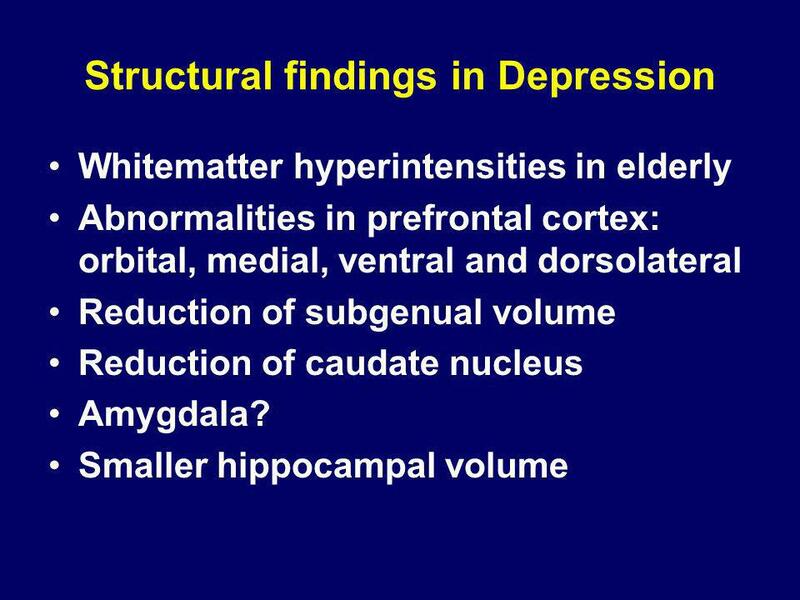 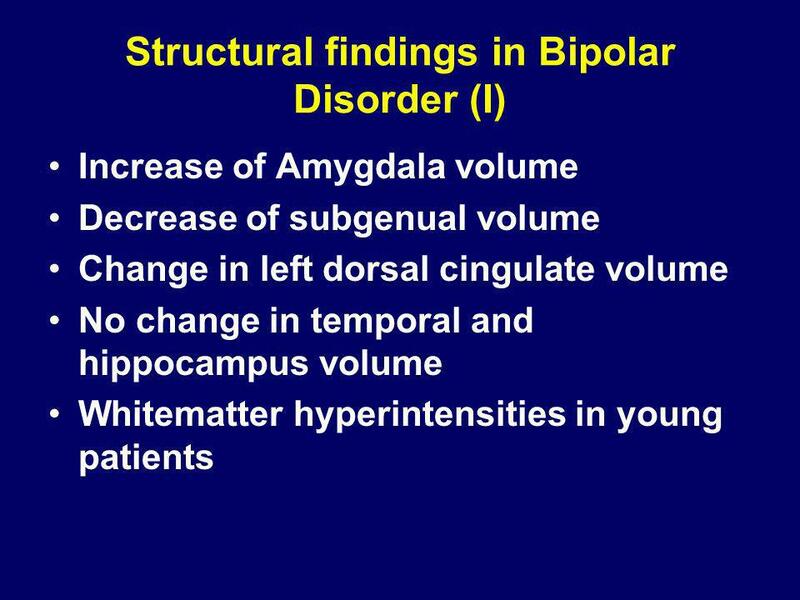 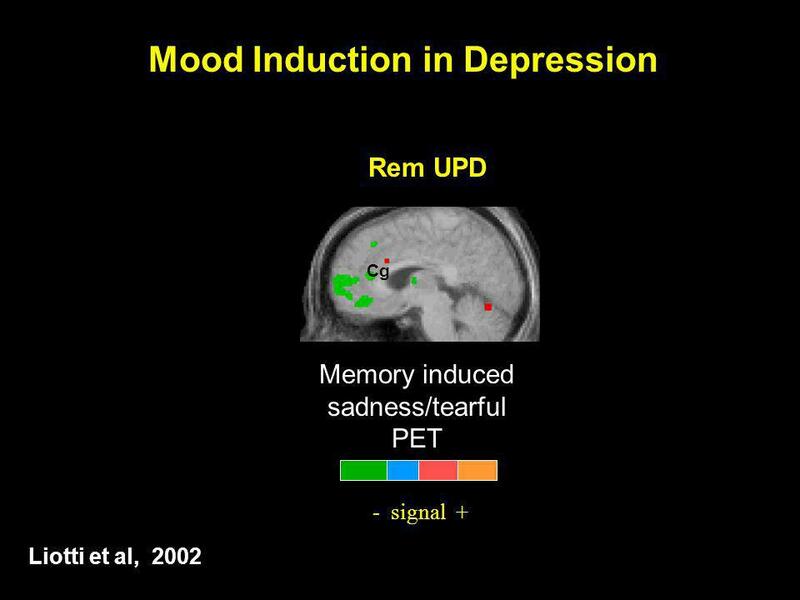 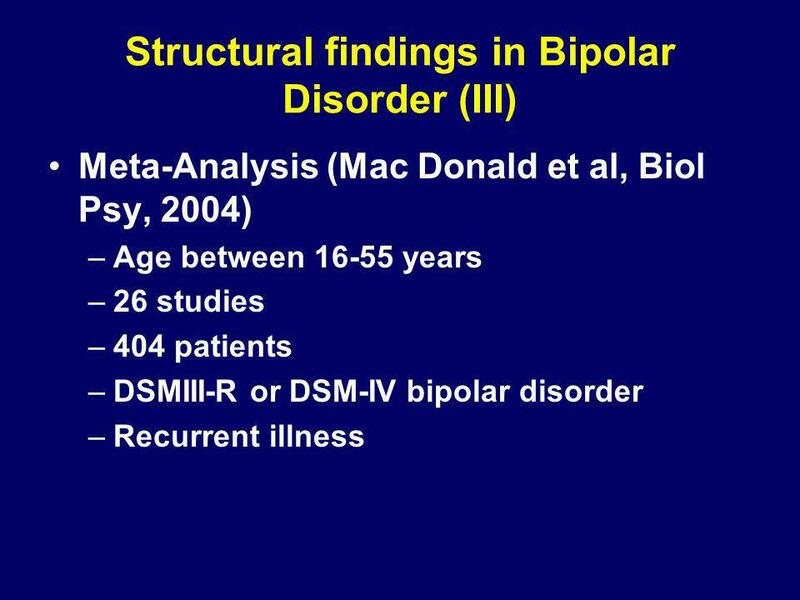 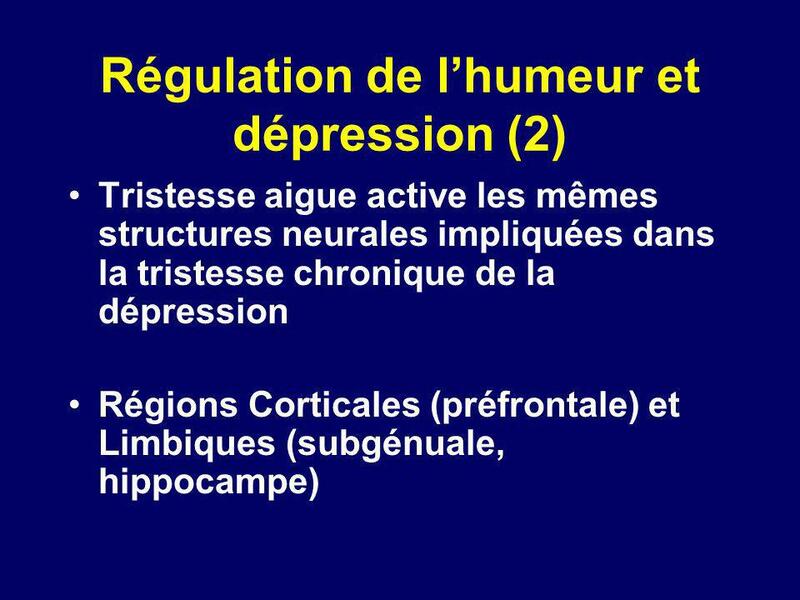 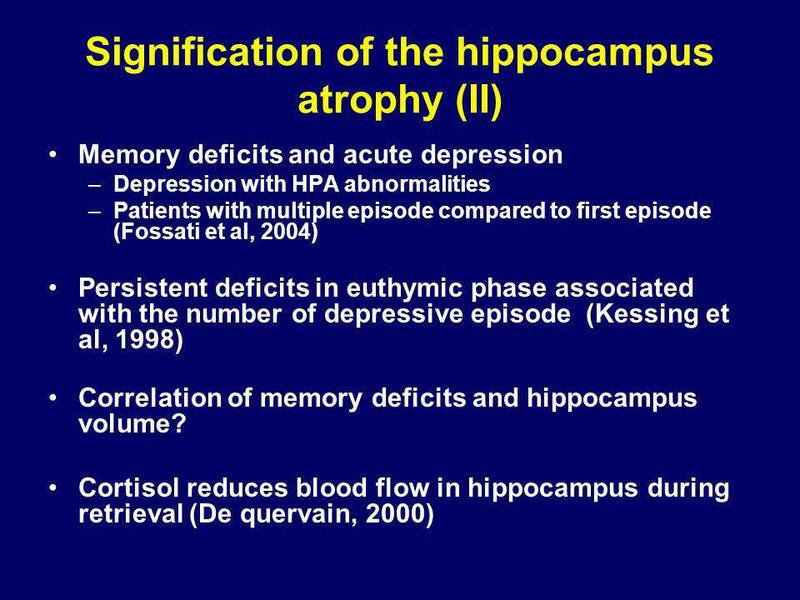 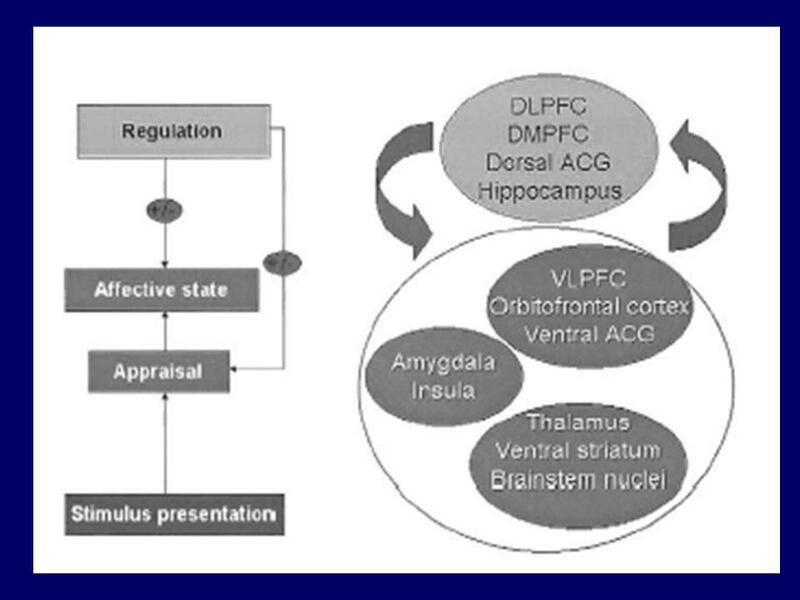 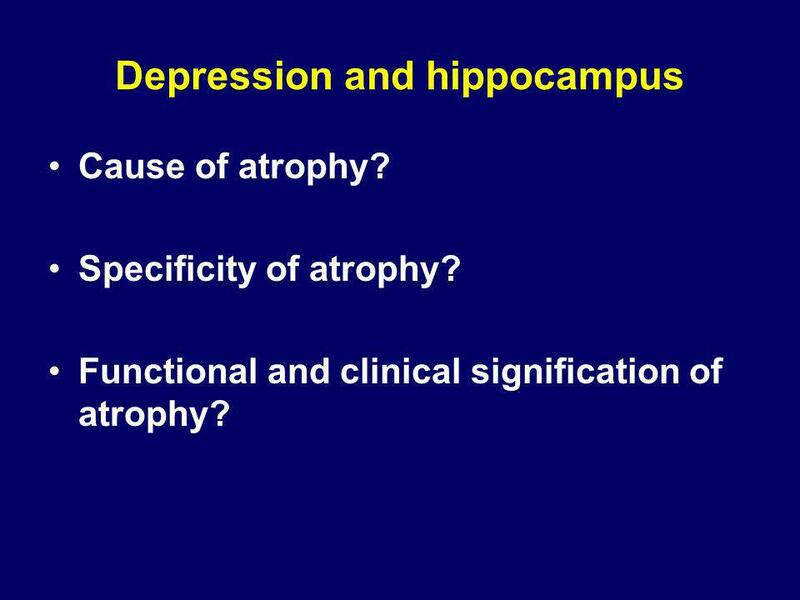 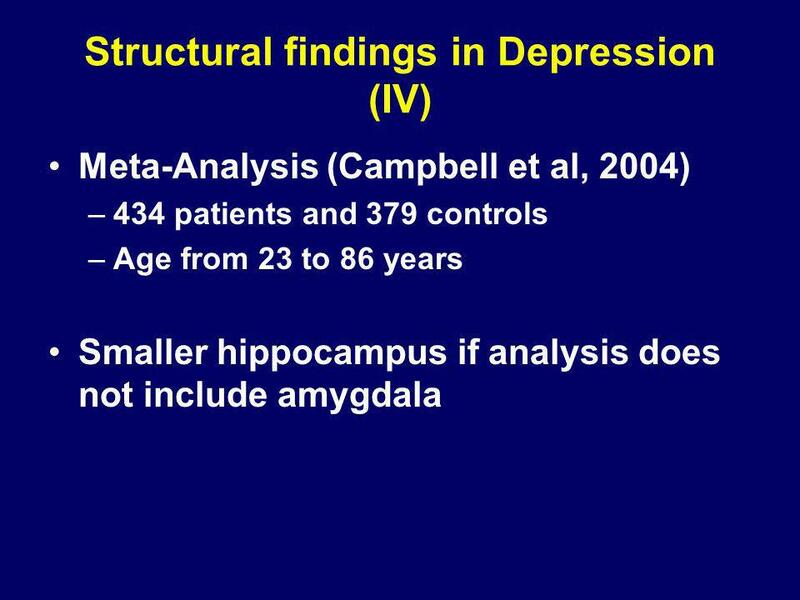 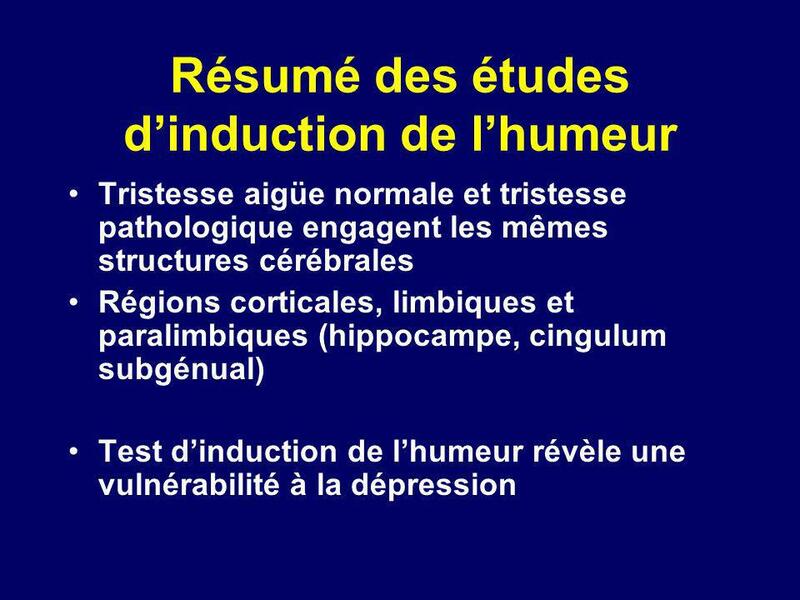 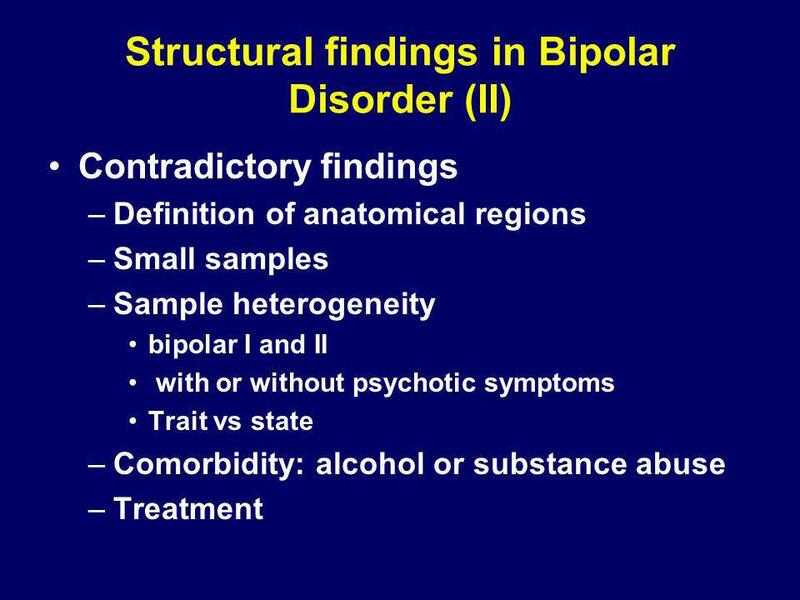 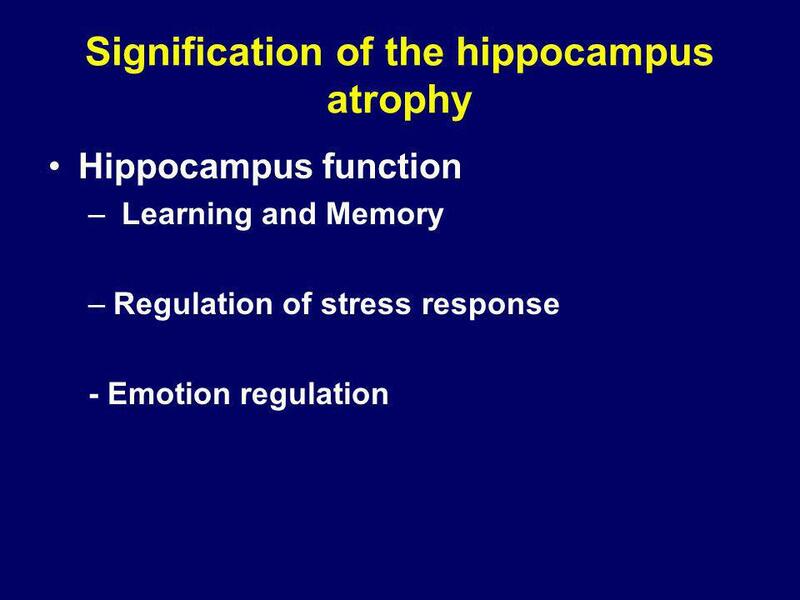 Are these structures involved in the pathophysiology of depression? 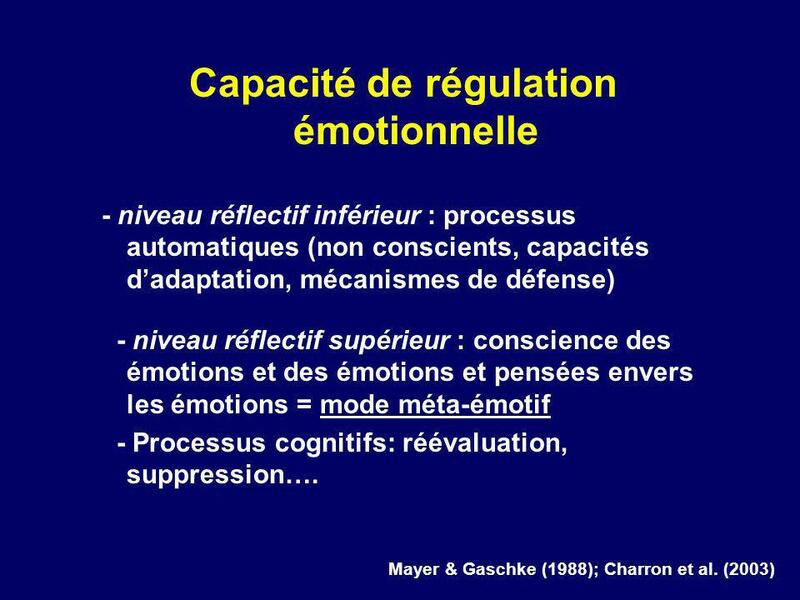 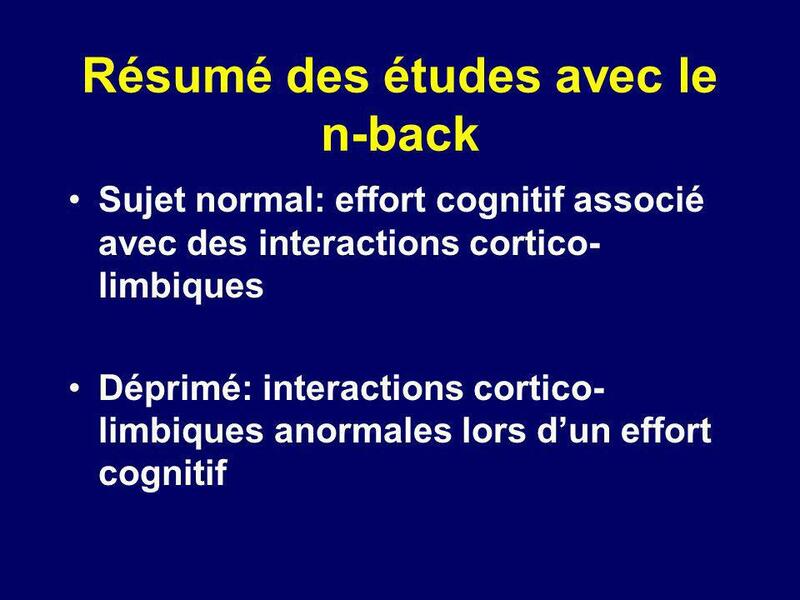 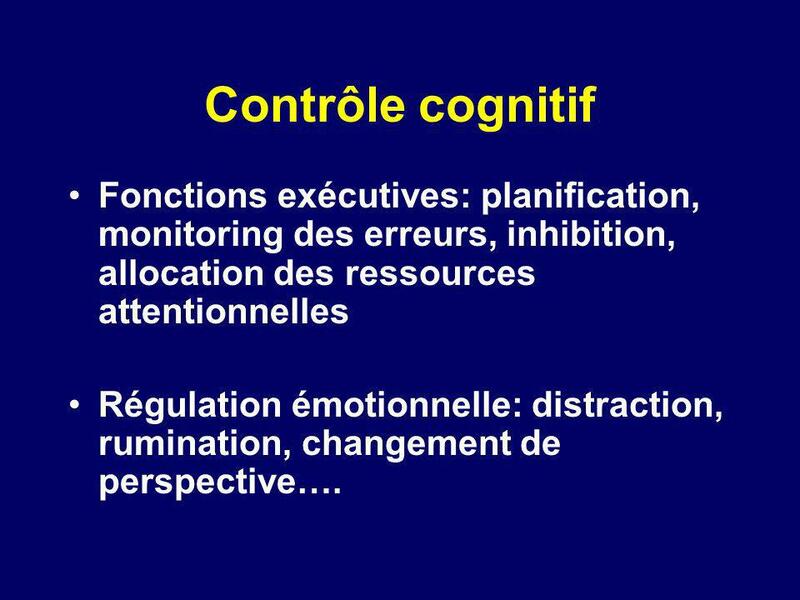 Trait ou dimension de personnalité Génétique Environnement Mesures de ces traits de personnalité: TCI or NEO ‘Neuroticism’: sensibilité accrue aux affects négatifs et un facteur de risque de nombreux états psychopathologiques An other way to investigate the neural structures involved in normal and pathologic mood regulation is to investigate subjects at risk for depression Many risk factors for depression have been described including genetic and environmental factorsPersonality trait or dimension have been associated with an increase susceptibility to depression Neuroticism, defined as an increased sensitivity to negative affect, a risk factor for depression Individual variability in emotional reactivity is an area of growing research interest, as suggested by recent studies examining genetic links to the personality trait Neuroticism (Lesch and Mossner, 1998; Neumeister et al., 2002), the temperamental hypersensitivity to negative stimuli or the tendency to experience exaggerated negative mood states in situations of emotional instability or dissonance (Santor et al., 1997). 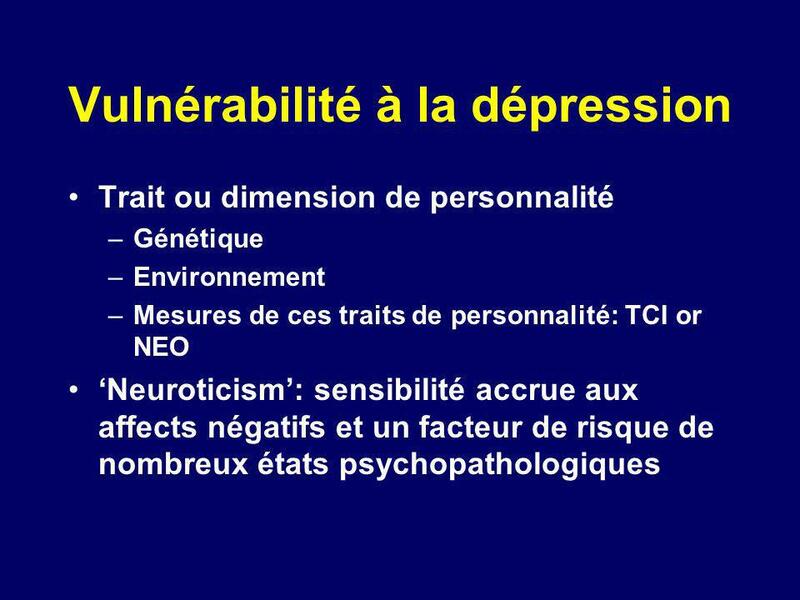 High trait levels of neuroticism are of potential clinical interest, as this temperament marker has been suggested to increase vulnerability to psychopathology such as depression, anxiety, biopolar disorder and aggression (Beck et al., 1979; Henriques et al., 1994; Teasdale, 1999; Segal et al., 1999) In both groups there was a common pattern of increased activity in subgenual cingulate (Cg25) and hippocampus, along with decreased activity in dorsolateral prefrontal cortex (BA9) associated with acute sadness. 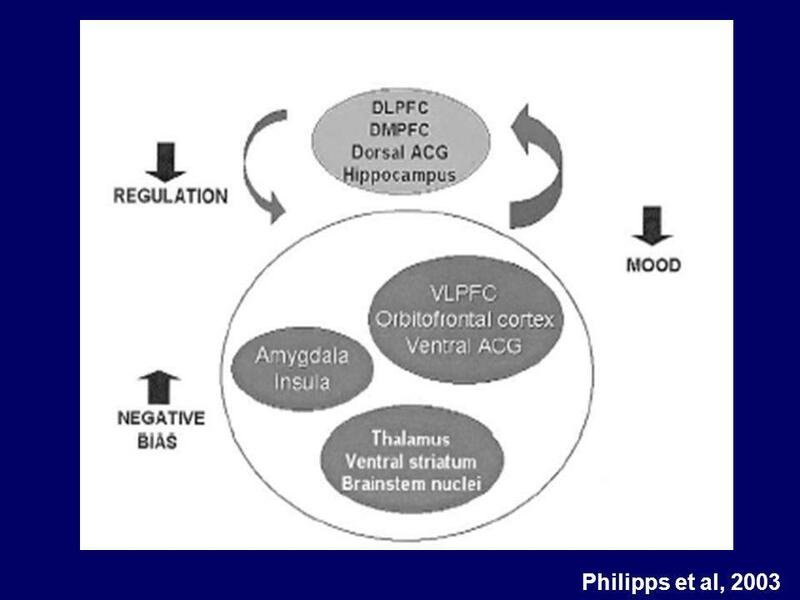 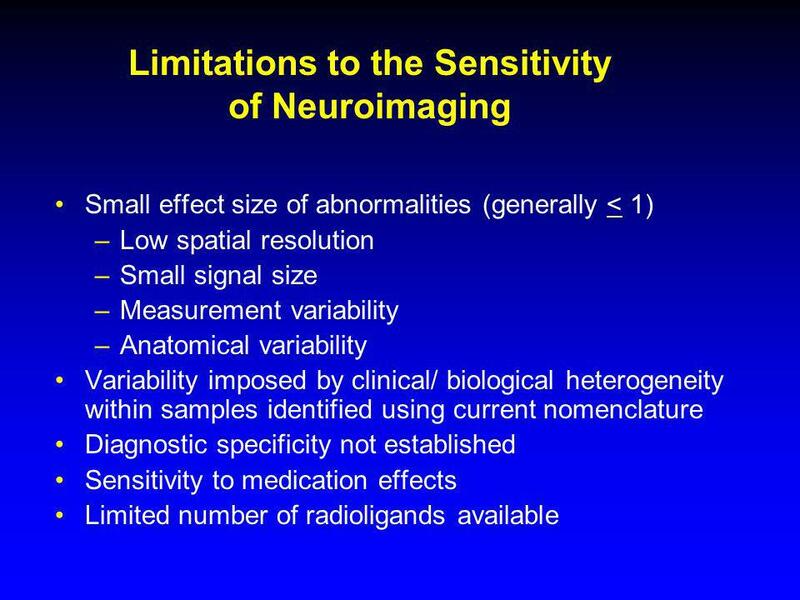 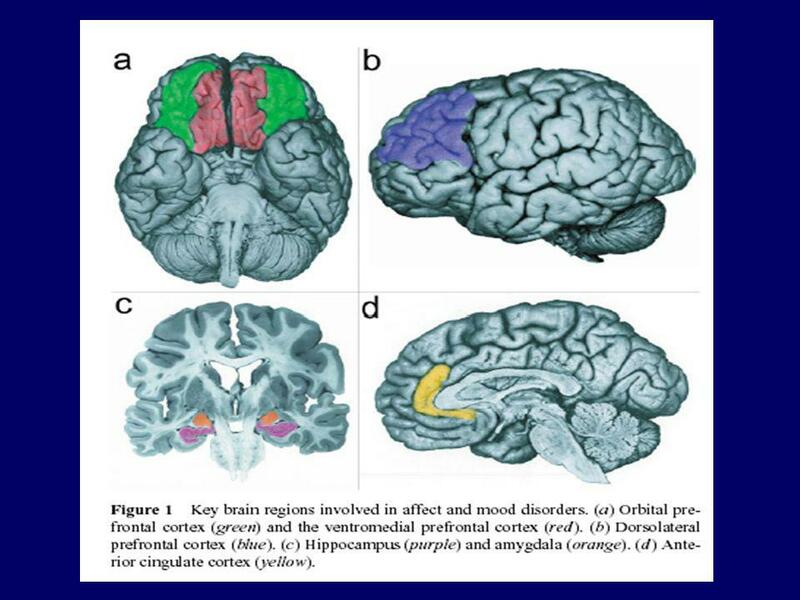 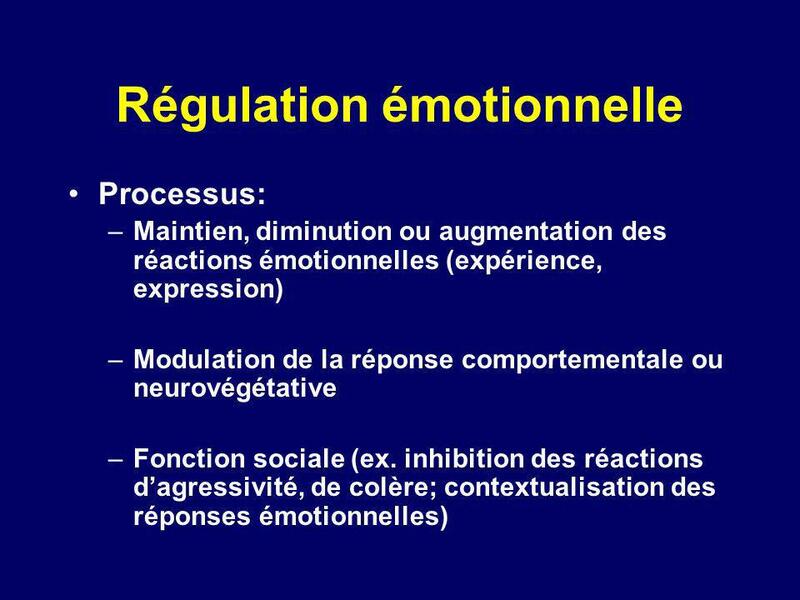 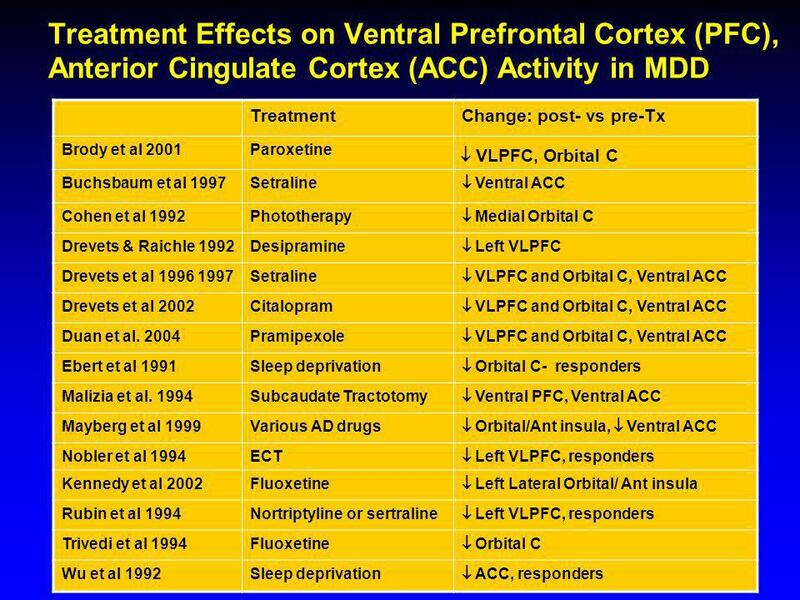 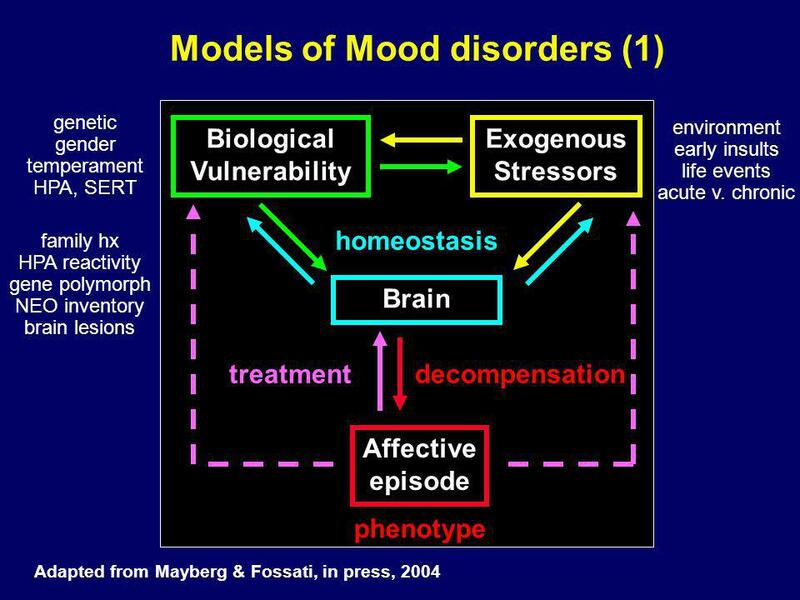 This pattern is consistent with previously reported findings in unselected healthy controls (George et al., 1995; Mayberg et al., 1999; Damasio et al., 2000; Liotti et al., 2002) suggesting that these regions are critical to the normal regulation of acute changes in mood state. 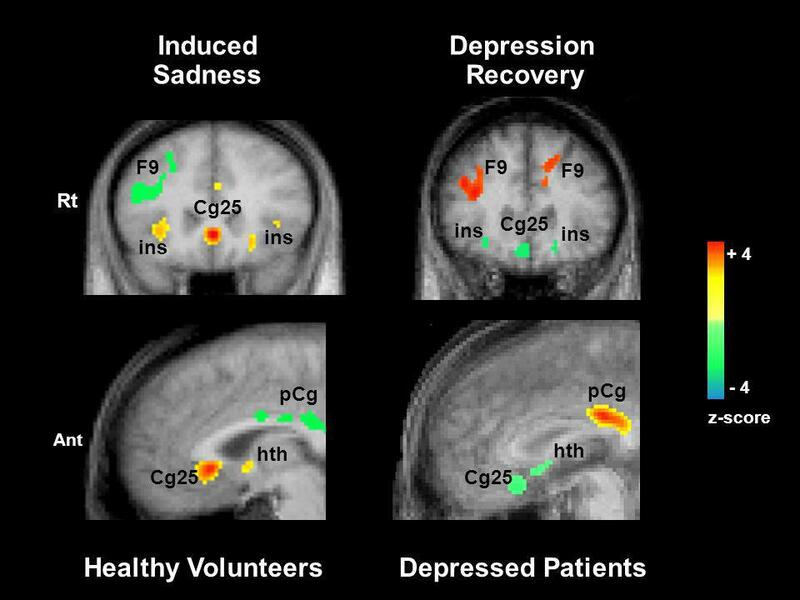 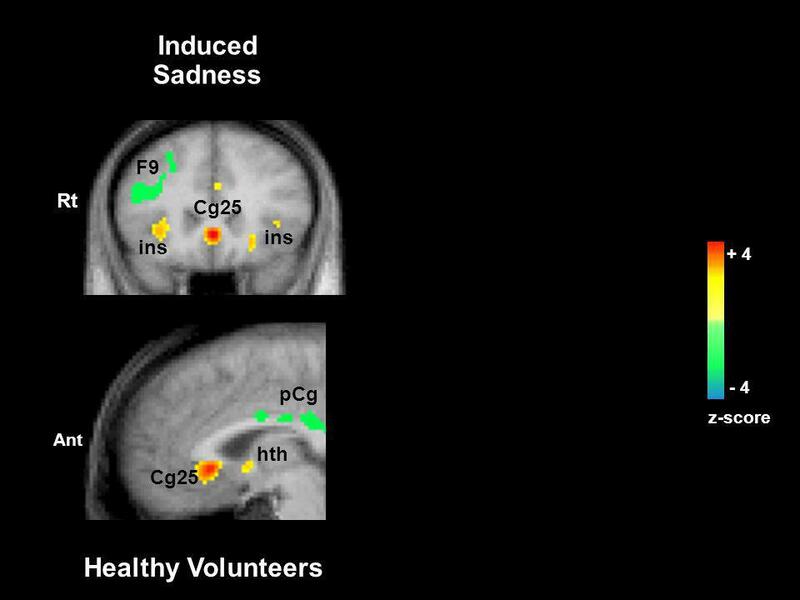 A second, group-specific pattern was seen only in the hiNloE group under emotional stress (i.e. 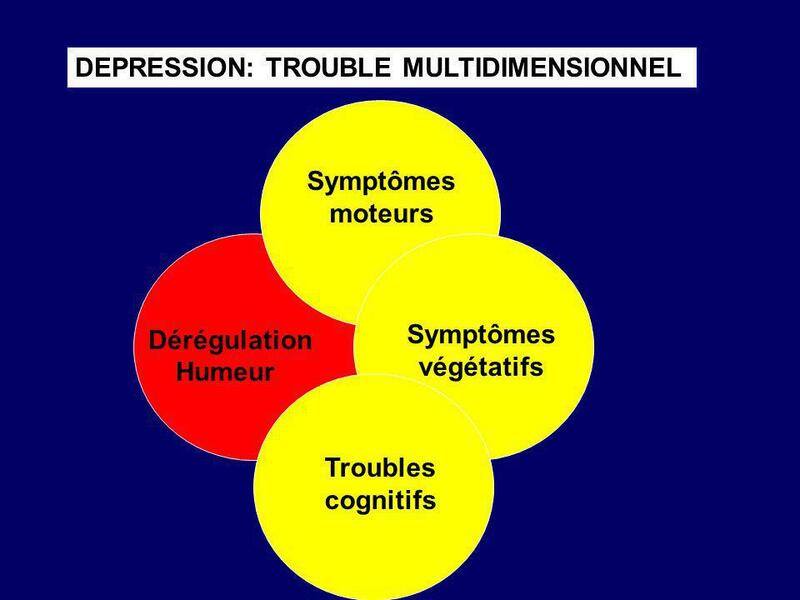 with sad mood provocation). 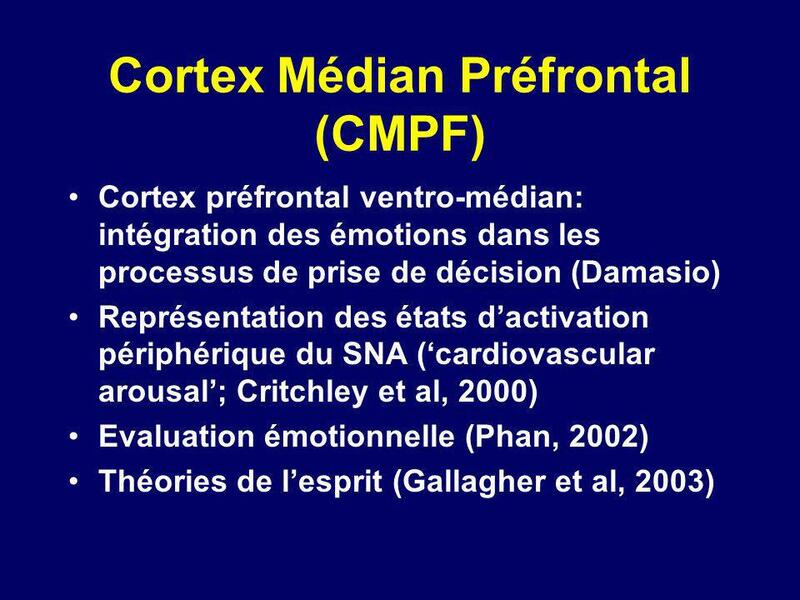 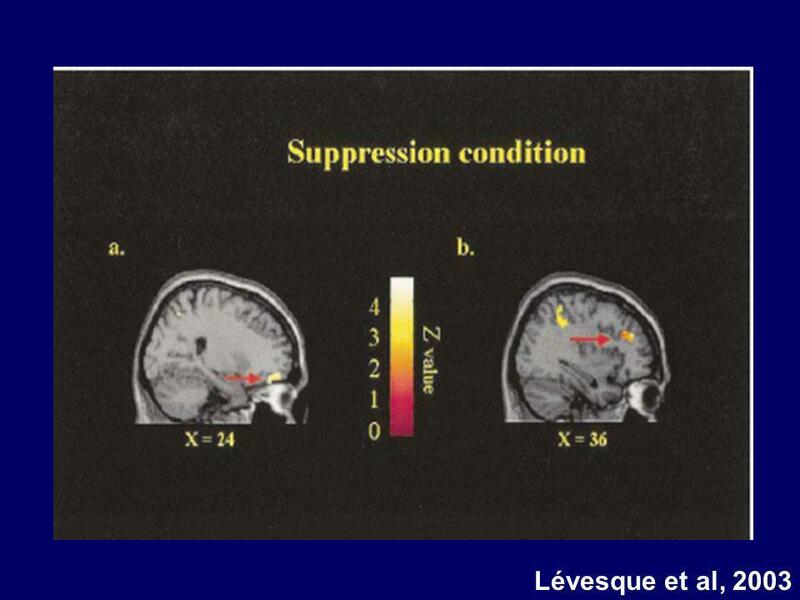 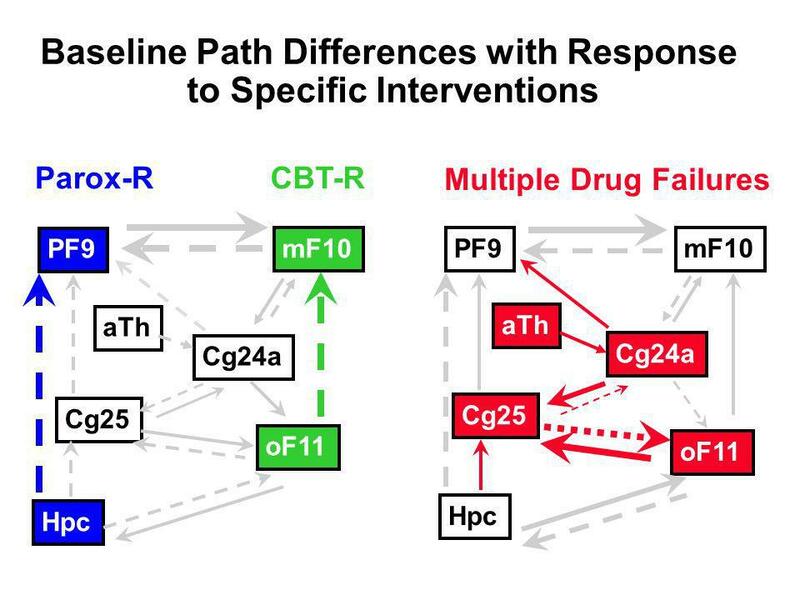 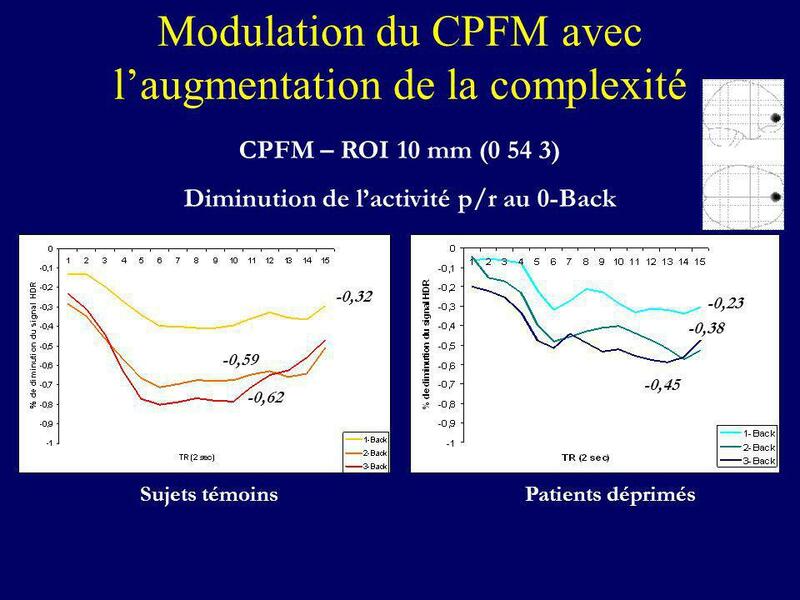 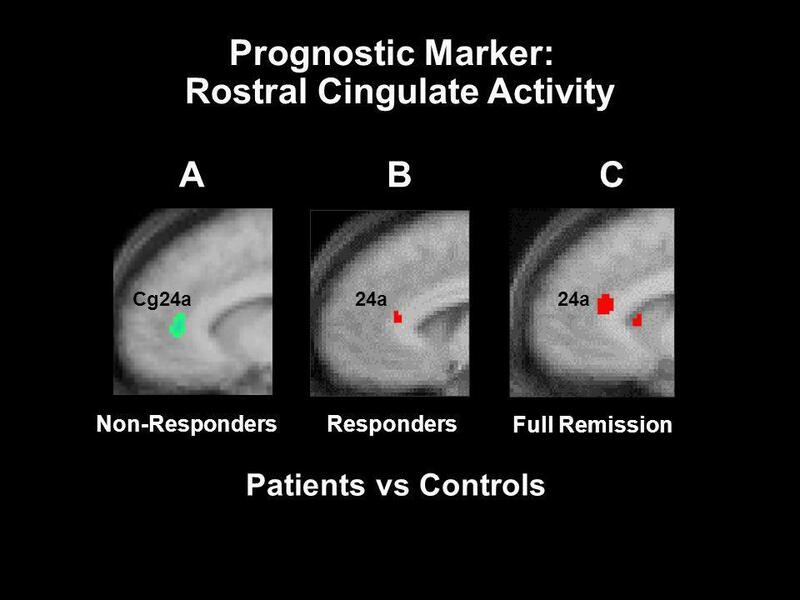 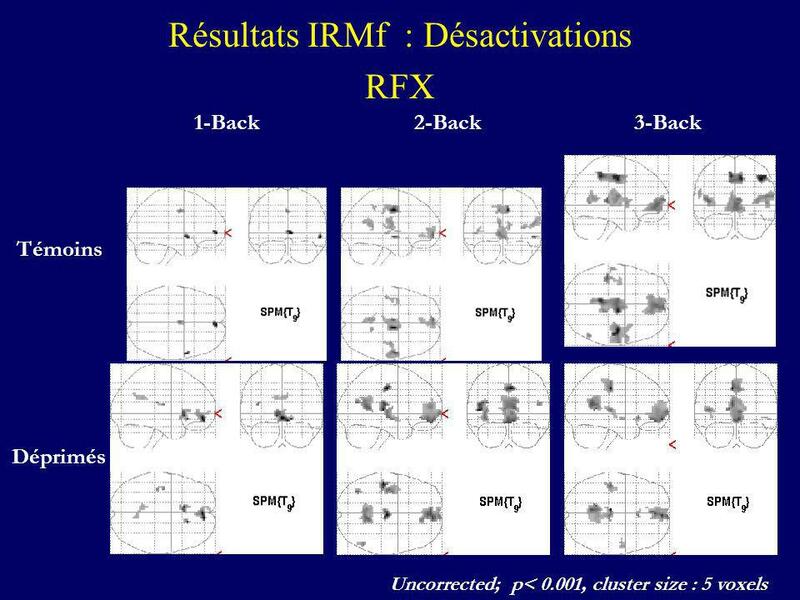 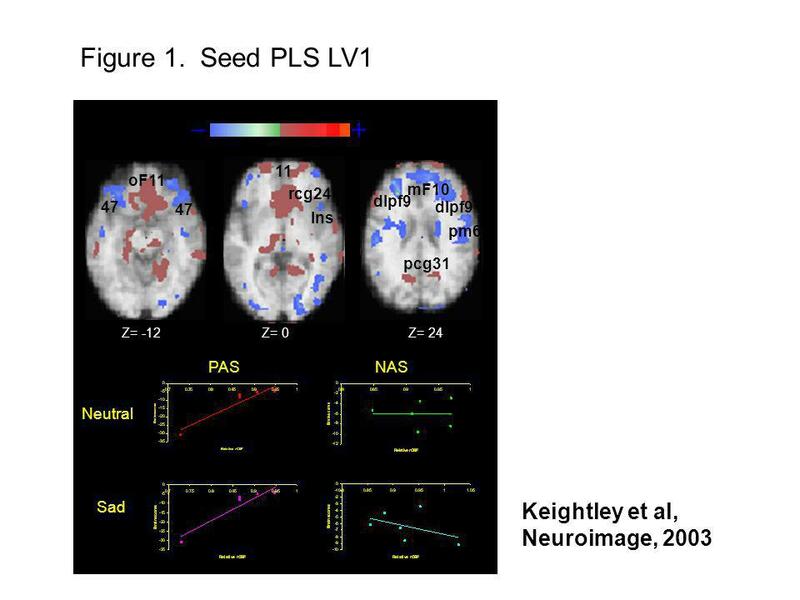 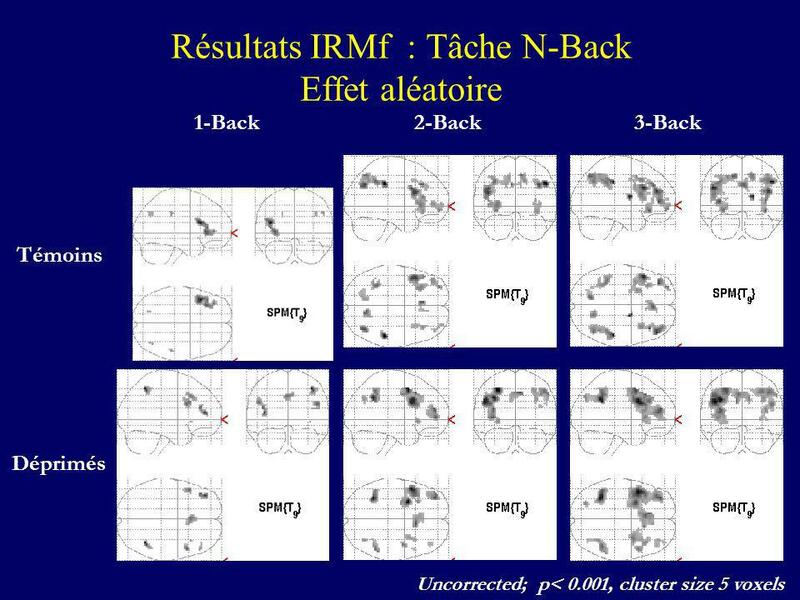 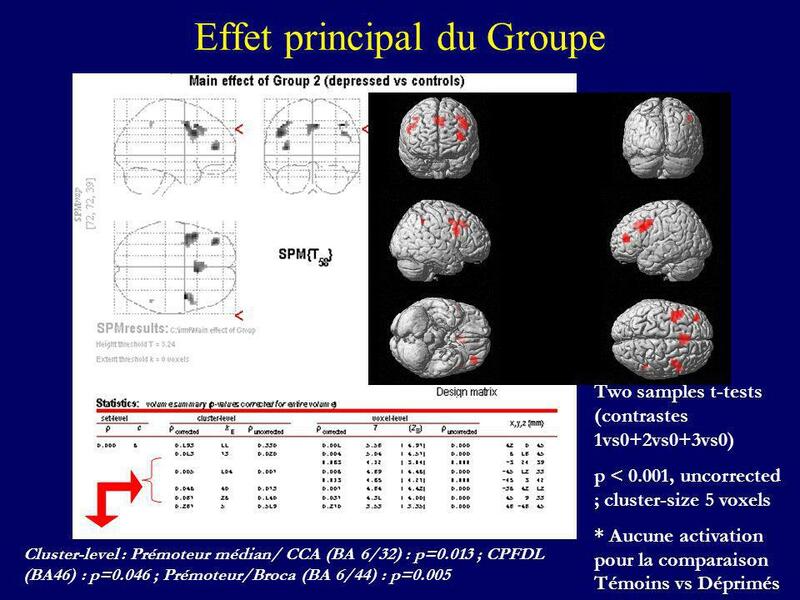 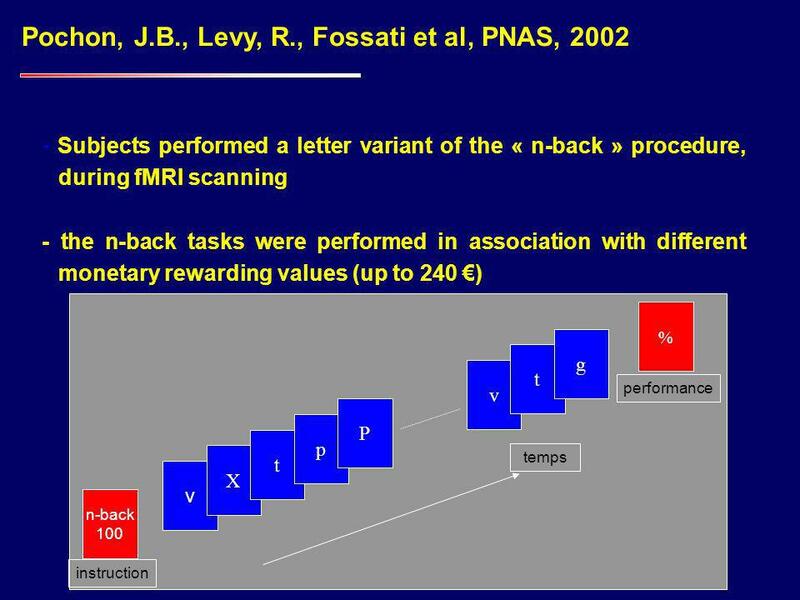 This pattern again involved increased activity in Cg25 but in association with decreased medial prefrontal activity, a pattern not seen in the loNhiE group. .
43 Contrôle cognitif Fonctions exécutives: planification, monitoring des erreurs, inhibition, allocation des ressources attentionnelles Régulation émotionnelle: distraction, rumination, changement de perspective…. 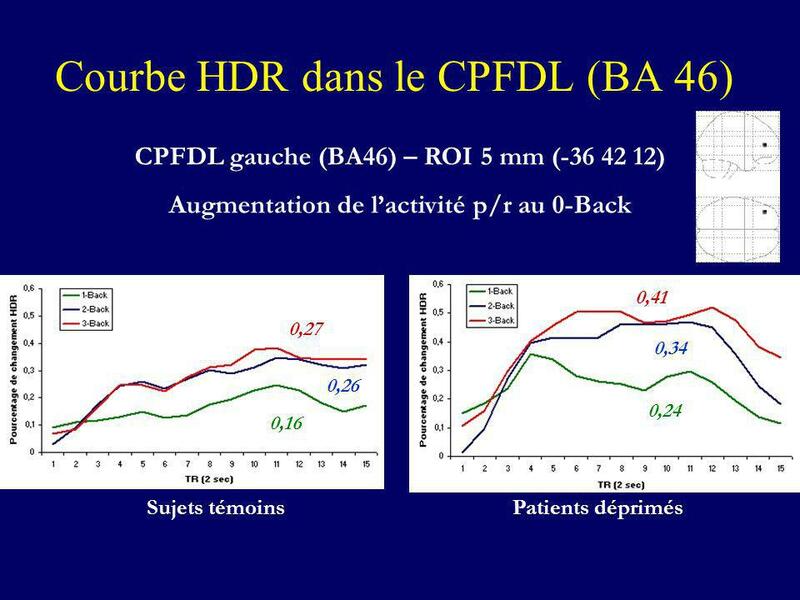 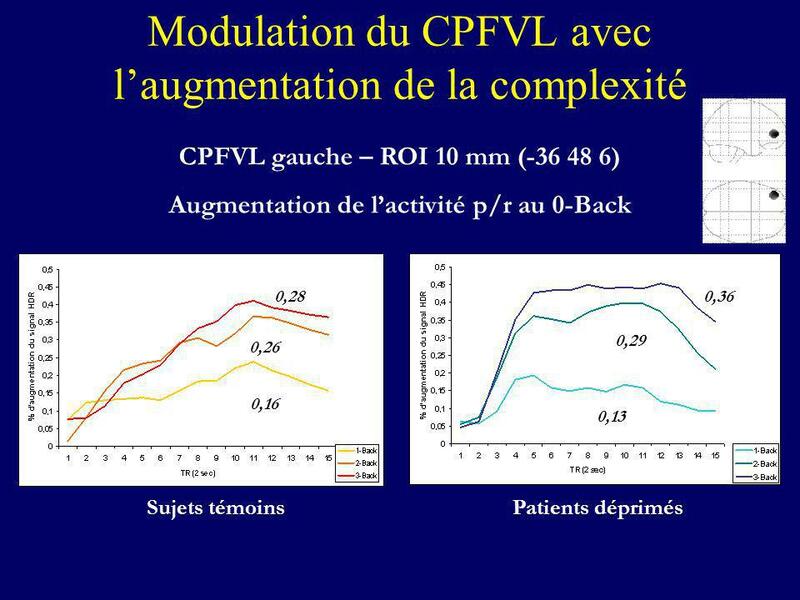 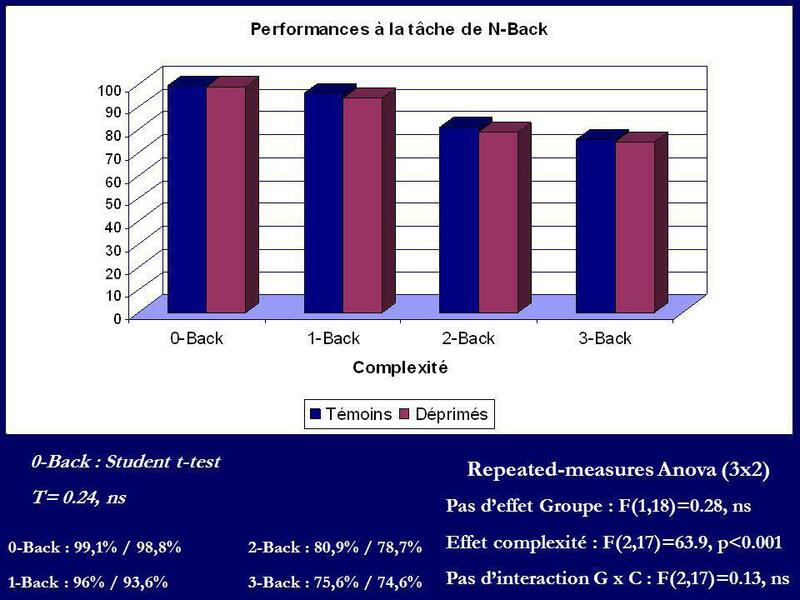 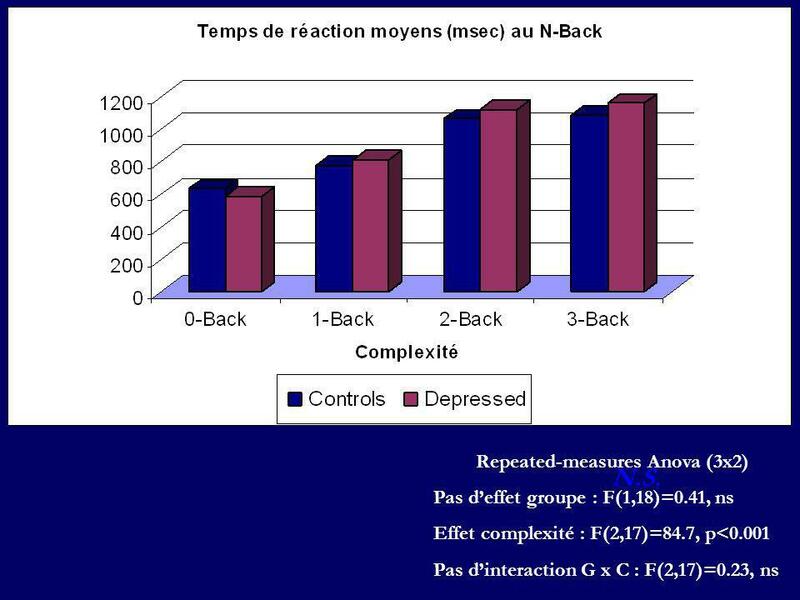 Pas d’effet groupe : F(1,18)=0.41, ns Effet complexité : F(2,17)=84.7, p<0.001 Pas d’interaction G x C : F(2,17)=0.23, ns N.S. 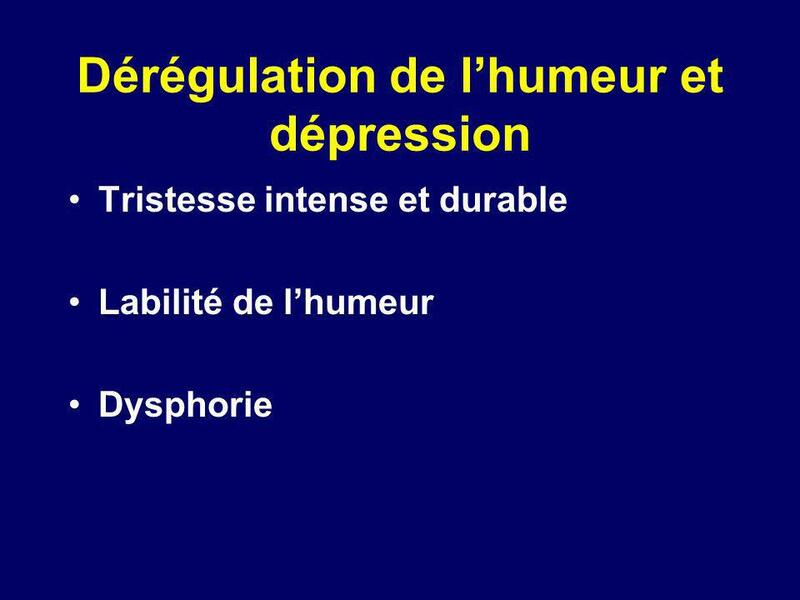 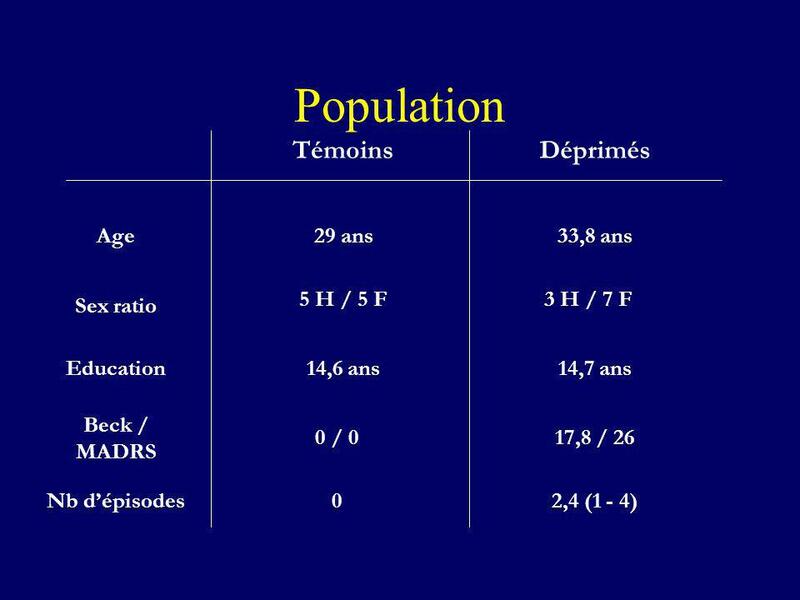 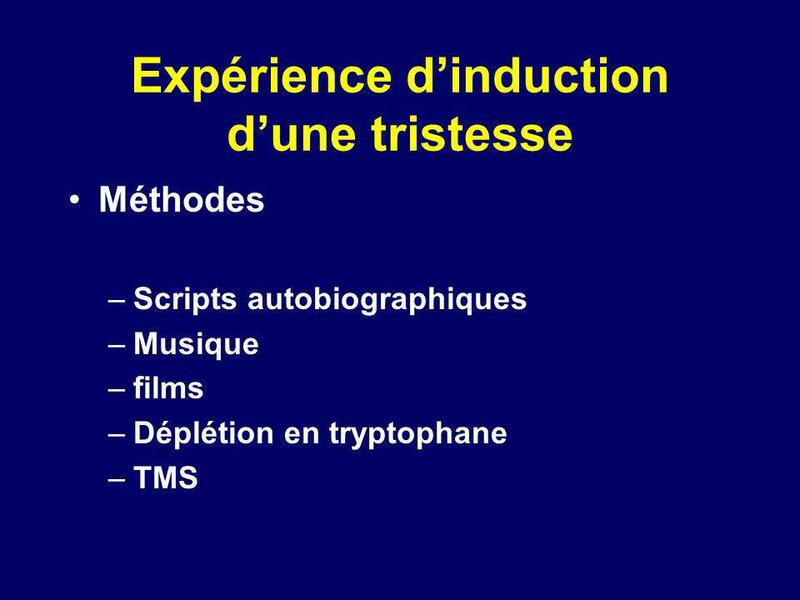 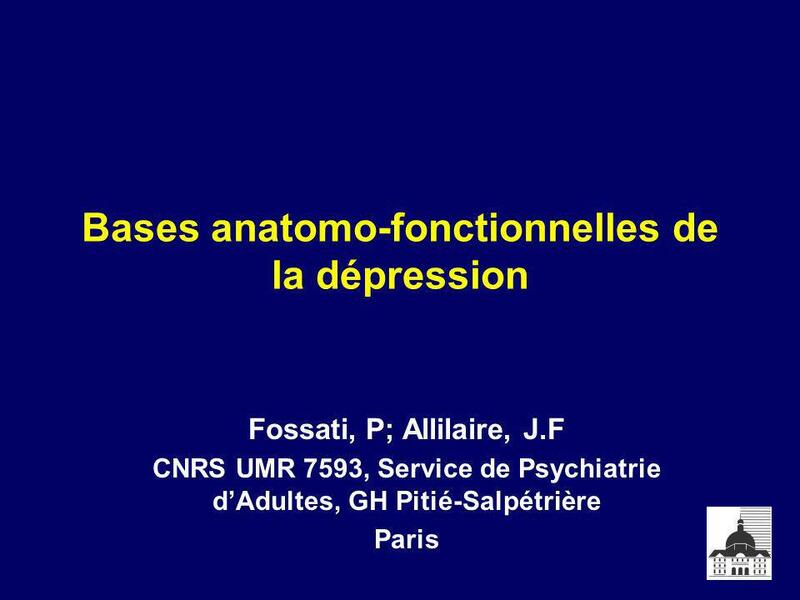 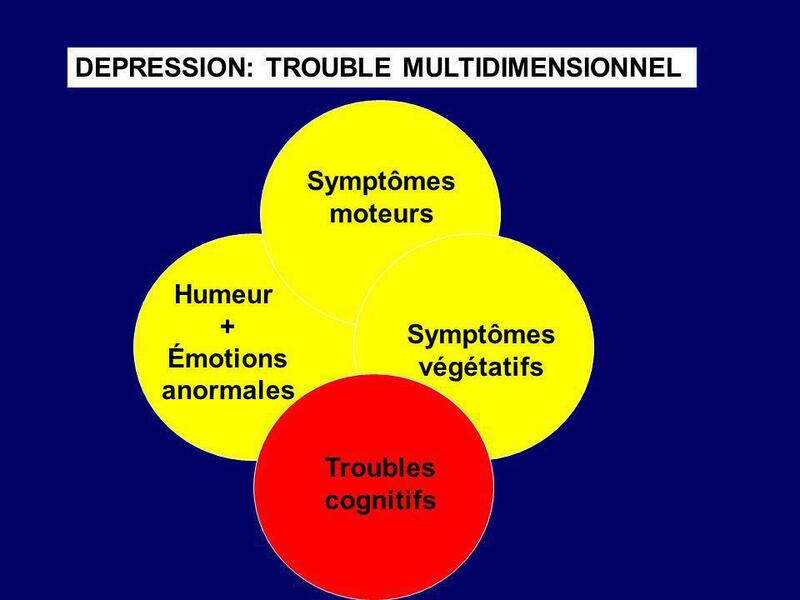 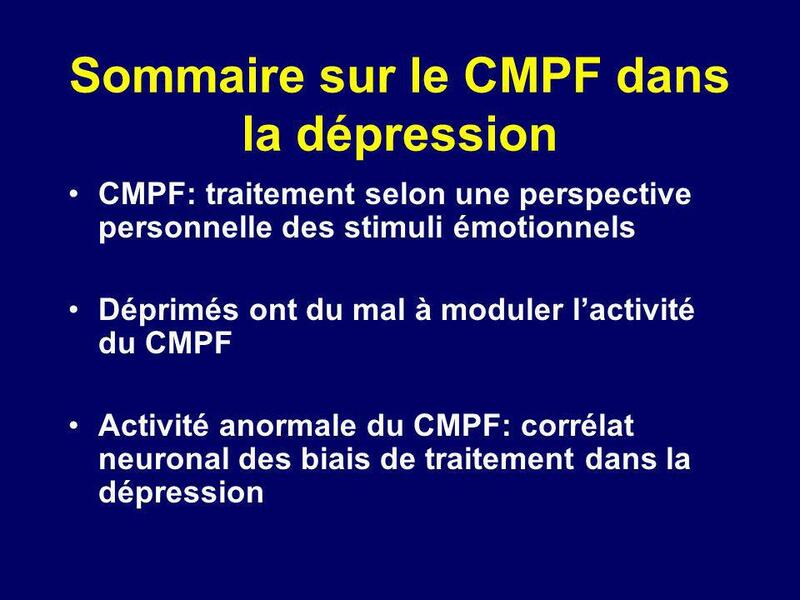 Télécharger ppt "Bases anatomo-fonctionnelles de la dépression"
1 Ge Borgès Da Silva, Gi Borgès Da Silva, F Gazano-Jouanon, G Kulling, JC Mabriez Direction régionale du service médical,195 Bd Chave F Marseille. 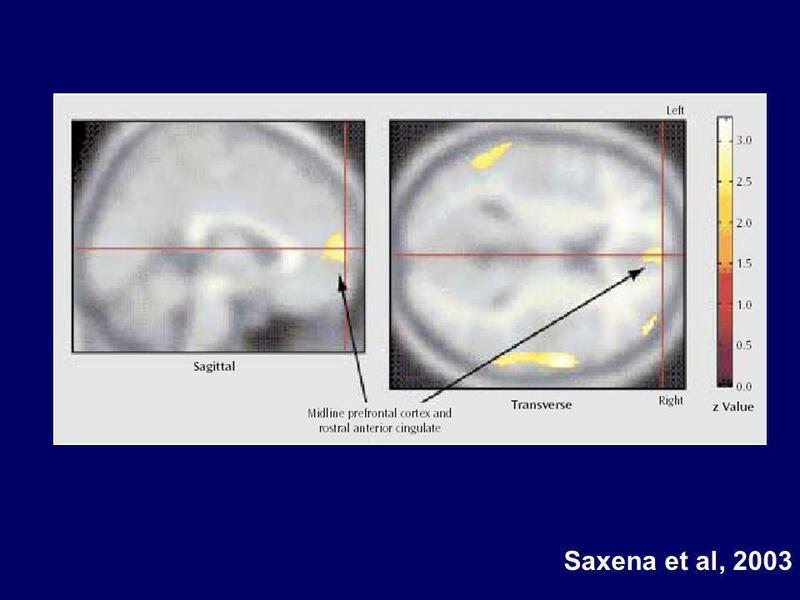 Optic nerve Chiasma Lateral Geniculate Nucleus (LGN) Optic radiations Area V1 OPTIC CHIASMA.